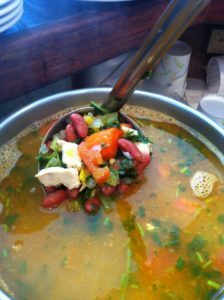 Good Gracious Catering | Soups On! We get a LOT of high praise for our soups! Many of our corporate clients order soup at least once a week for the office. The secret? One of Chef Sandra’s favorite things to make. “I love to continually experiment with different combinations of ingredients and seasonings and I love how it makes our kitchen smell. Sandra’s favorite soups? Chicken Black Bean & Rice and Mexican Tomato Soup. If you have had either of these soups, and want to make them at home, these are the ingredients Sandra usually includes in them, unless she changes her mind that day! Chicken Black Bean & Rice Soup. Sandra starts with adding sliced chicken (like you would slice for fajitas) to the chicken stock, and boils. Add, onions, tomatoes, green peppers and rice (cook the rice in the stock). She adds pre-cooked black beans, cumin, lots of smoked paprika, oregano, chili powder and salt and pepper. Sometimes she adds potatoes instead of rice. Mexican Tomato Soup– Pureed tomato base. Add hot sauce, jalapenos, onions, green peppers, garlic, paprika, touch of cumin and pasta. Finish with chopped cilantro on top.